Markings: The right side of the slide is marked ”GOLD CUP / NATIONAL MATCH” and with a trophy cup. The left side of the slide is marked “SERIES '80 COLT MK IV / GOLD CUP NATIONAL MATCH” with the rampant Colt logo. The right side of the frame is marked “COLT'S PT. F.A. MFG. CO. HARTFORD, CONN. U.S.A.” and with the serial number. 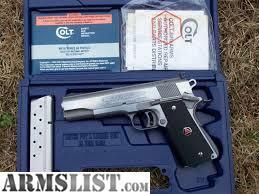 The barrel is marked “-COLT 45 AUTO N.M.-". The top of the rear sight is marked "ELLIASON". Sights : The front sight is a blade fixed to the full-length rib on the top of the slide. The rear sight is an Elliason target sight adjustable for windage and elevation pinned to the rib. Stock Configuration & Condition: The grips are wraparound textured black rubber with gold-colored Colt medallions.